Professional and home chefs alike know that the Santoku is one of the knives everyone should have in their kitchen. 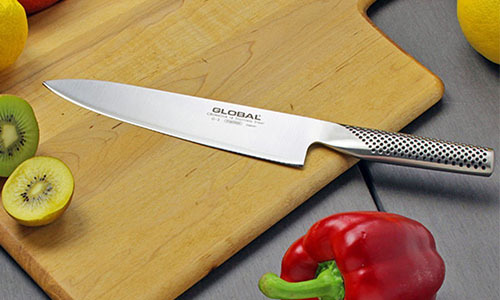 Thanks to the wide blade, flat edge, and curved tip, it’s your go-to knife for chopping vegetables without losing time. In addition, “Santoku” is the Japanese term for “three virtues”, represented by slicing, mincing, and dicing. 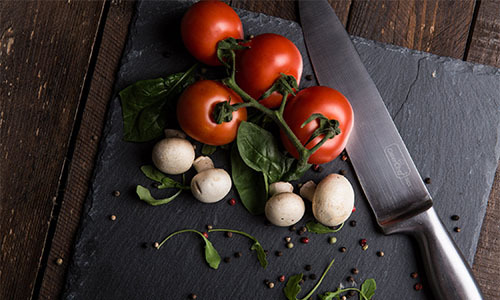 We aim to help you find the best Santoku knife for your meal preparation work this year, so check out the top-performing models below and take your pick. We’ll start off on an inclusive note with a knife anyone can rely on for their daily needs. Our aim was to identify the best Santoku knife for multiple purposes, whether slicing, chopping, dicing or more. From our perspective, the Mac SK-65 knife is a fine choice for day-to-day kitchen use. 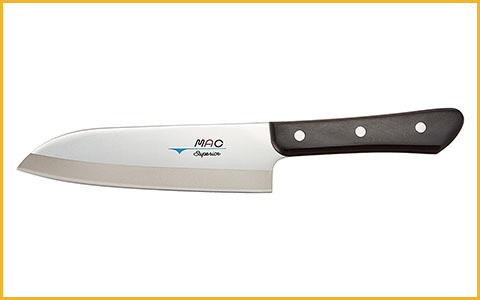 The model features a 6 ½-inch blade, perfect for beginners and experienced chefs alike. At the time we were reviewing it, the Mac SK-65 had an Amazon price of about $75. Mac’s SK-65 model is designed to please a wide range of users that need a “workhorse” knife. The blade is made from high-carbon stainless steel and measures 6.5 inches. As a result, you benefit from quick and swift operation regardless of the items you’re working with. At 5.4 ounces, the SK-65 may be a bit light for some people’s preferences, but it’s great when cooking for long hours. A slight disadvantage is its asymmetrical cutting edge, which may not work for left-handed users. Mac is a highly appreciated brand in the mainstream cutlery industry. Their models are known for withstanding even a decade of frequent use, as long as they’re taken care of properly. Several SK-65 customers complained about rust spots or chipping, but most of the time it’s in the way you maintain your knife. What makes the Mac SK-65 stand out is its amazing performance in terms of sharpness. It’s reputed for holding an edge for a long time, so you can count on it for demanding kitchens. We recommend the Mac SK-65 as the best Santoku knife for various cooking tasks. 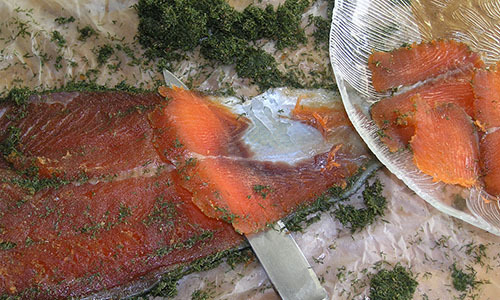 It arrives and stays sharp, all while providing a greatly satisfying cutting, dicing, and slicing experience. Damascus steel is globally praised for its spectacular quality. Obtained through the traditional Japanese method of hammering layers, Damascus Santoku knives are really a class of their own. One of our personal favorites is the 7-inch HDSA18 from renowned brand Yoshihiro. The model is breathtaking all around, from craftsmanship to performance. At around $115 on Amazon, it does come at a price, but it’s worth every penny if you’re a devoted chef. You will be blown away by how beautiful the HDSA18 is right out of the box. All Yoshihiro knives are handcrafted by Japanese artisans, and anyone can appreciate the tremendous attention for detail. The HDSA18 model, in particular, contains 16 layers of manually-hammered steel. As a result, the 7-inch blade will have a traditional wave pattern that’s just as pretty as it is practical. The knife is full tang, ending in a triple-riveted, Western-style handle made from mahogany wood. 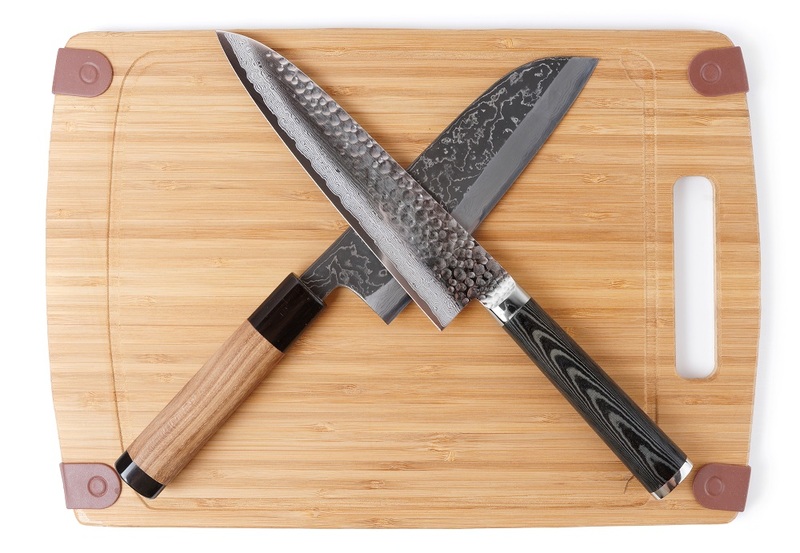 When we reviewed the best Japanese chef knives of the year, a Yoshihiro model was our #1 choice. With this fact in mind, this model’s price point, and the spectacular finish, you can imagine that it’s top quality. Performance-wise, the HDSA18 has a fine weight of 6.2 ounces, perfect for obtaining optimum balance. While the model is incredibly sharp, some users complained about the sharpening process when the time came. Apparently, it’s difficult to get it as sharp as it initially was. 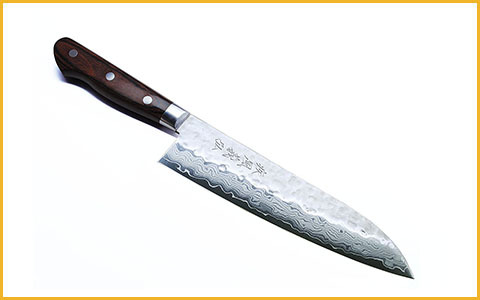 You should invest in the Yoshihiro HDSA18 if you want the best Santoku knife with authentic Damascus steel. Indeed, it is expensive, but premium craftsmanship and optimum quality do come at a price. We often recommend chef knives as lovely gifts for special occasions. Whether you’re attending a housewarming party or wedding, a high-quality knife will be a wonderful addition to their kitchen. From where we stand, the 7-inch Orient knife is the best Santoku knife for gift-giving. It currently costs around $90 on Amazon, but it shares features and quality specs with far pricier models. Additionally, you get plenty of extra value through accessories and packaging. Depending on your tastes, the Orient Santoku can either be eye-catching or a bit on the tacky side. The majority of customers compliment its sleek finish, especially the mosaic detail on the handle. However, some feel that the Damascus pattern, scalloped edge, and large branding are a bit too much. In any case, the model is gift-ready, from its classy box to the included accessories. The Orient Santoku comes with a protective cover, but also a cloth for keeping the knife in tip-top shape. Aside from a few preference-related complaints, there isn’t that much negative feedback surrounding the Orient Santoku. The 7-inch blade contains 66 layers of VG-10 Japanese super steel, ending in a G10 handle. Moreover, the blade has a Rockwell hardness rating of 61 (±1), ensuring a long product life. Some feel that the balance is too handle-oriented, compared to traditional Santokus. Still, the bolster-heel area is reported to be very comfortable for active chefs. We encourage you to try the Orient model if you’re looking for the best Santoku knife for gifts. You get outstanding value through the accessories and quality provided for the price. Traditionally, Santoku knives are made of high-quality Japanese steel. Nevertheless, modern home kitchen demands have resulted in the production of ceramic Santoku knives. Ceramic is a nice alternative for those in need of a budget-friendly alternative for smoothly slicing vegetables on a daily basis. We support the Kyocera Revolution FK-140 WH as one of the best Santoku knife options that come with ceramic blades. It has a list price of $50 on Amazon, but you can often find it on sale. The Kyocera Revolution knife features a 5.5-inch blade made from Zirconia Z206, a ceramic blend created in Japan exclusively for the brand. When purchasing your knife, you can choose from eight different colors for the plastic handle: blue, green, orange, pink, red, yellow, black or white. Together with the blade and handle, the FK-140 WH measures 12.2 inches. While the ceramic knife is not recommended for tough vegetables or meats, it’s fine for thinly slicing soft veggies. Unfortunately, quality seems to be the major drawback with the Kyocera Santoku. The blade is extremely brittle, with numerous reports of chipping, cracking, and breaking, even when used properly. On the bright side, the Kyocera knife arrives perfectly sharp and is applauded for retaining an edge far longer than a steel knife. Despite its light weight of 3.2 ounces, the model is said to be quite well-balanced. Also, it provides a clean performance every time you slice vegetables. 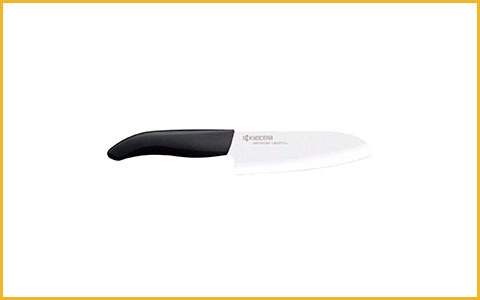 Get the Kyocera Revolution FK-140 WH if you desire the best Santoku knife with a ceramic blade. Although you have to be very careful when using it, the ceramic knife will likely stay sharper for a longer time than traditional models. Maneuvering a chef’s knife can be a nightmare for a person with smaller hands. Most Santoku knives are designed to accommodate regular to large hands, while the blade is usually 7 inches long. However, there is a user-friendly alternative for small-handed customers. The Global GS-37 knife is perfect for swiftly preparing meals, even if you don’t have the average-sized hands. It can currently be bought for $95 on Amazon, where it enjoys dozens of 5-star reviews. The design specs of the GS-37 are perfect for customers that fit the profile we described above. While the blade is just 5.25 inches long, the entire knife measures just around 9 inches. 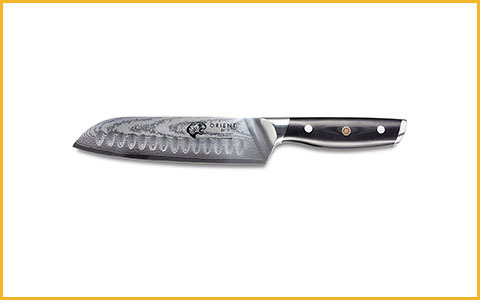 As with all Global knives, the GS-37 has a full steel construction, with an anti-slip handle. 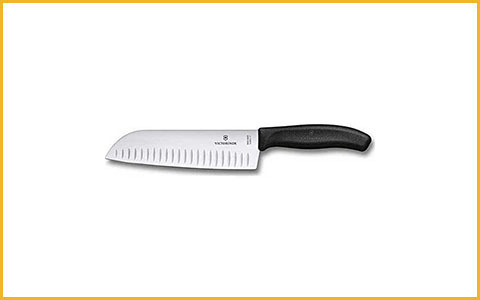 It maintains the classic Santoku silhouette, with a wide blade and a curved and pointed edge. Even if you don’t have small hands, the model does an amazing job at fine chopping, dicing, or slicing. It’s well-known in the cutlery industry that Global knives are top quality. Considering the one-piece design, the GS-37 is as durable as can be, with no reports of breaking or chipping. In addition, the hollow ground blade ensures that food doesn’t stick while you’re slicing. Even though the model weighs only 3.8 ounces, you benefit from just the right balance. The GS-37 comes extremely sharp, but it may not hold an edge as long as you’d want it to. If you have smaller hands, the Global GS-37 is definitely the best Santoku knife for you. It is smartly designed, comfortable to use, and built to last. Be that as it may, we don’t recommend the model for customers with big hands. On this note, we have yet another recommendation of a small but very, very powerful knife. In the mini Santoku category, you can’t get any better than the 5-inch Dalstrong knife. Don’t underestimate its small blade – the Dalstrong Mini packs in the performance of traditional Santoku knives (and possibly even more). When we were reviewing the Dalstrong Mini Santoku, it was priced at about $80 on Amazon, where it also has an astounding average rating of 4.9 stars from tens of customers. The coolest part about the Dalstrong Mini is that it looks and works exactly like a regular Santoku, just that it’s far more compact. It features a 5-inch AUS-10V steel blade with a Tsunami Rose Damascus pattern and dimpled sides for easy, stick-free slicing. Moreover, it comes gorgeously packaged in a deluxe box, with a high-quality sheath and polishing cloth included. 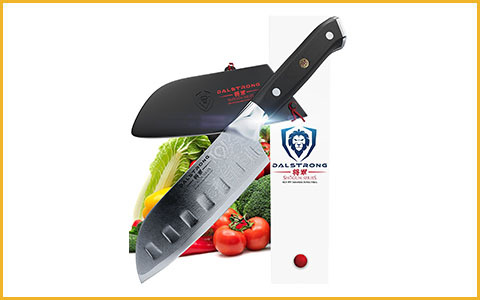 It also means that you can offer the Dalstrong Mini as a gift, at a fraction of the price of a full-sized Santoku. There’s no doubting the quality of Dalstrong cutlery. Rarely can you find complaints about their knives, and when you do, it’s usually just nitpicking. The 5-inch blade of the Mini Santoku glides through veggies and meats like butter, ensuring a smooth slice every time. Owing to the reduced measurements, the knife is super simple to maneuver no matter how small your hands are. Overall, it’s a highly versatile knife you can count on for working with any medium-sized foods. Try the Dalstrong Mini Santoku if you want a compact but incredibly effective knife. It’s easily the best Santoku knife in its size class and a top-rated model in general, with a highly satisfying performance. As you know by now, classic Santoku knives have blades that are 7 inches long. Considering that this is the average length for the style, you’ll have a broad range of traditional models to choose from. So how do you know which one is worth it? We believe the J.A. 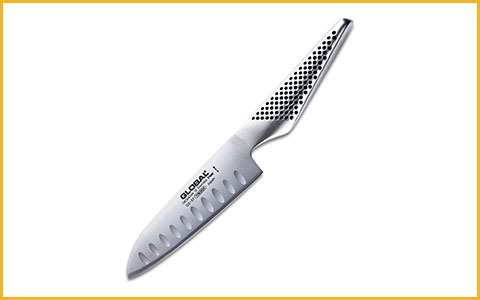 Henckels 31170-181 is one of the best Santoku knife options in its class, with plenty of features you’ll enjoy. It has a full Amazon price of around $92, but you can frequently find it with huge discounts, up to 50% off. The Henckels model has the size specs of a standard Santoku: 7” blade, 16” full length, and 6.4-ounce weight. Consequently, you’ll be able to use it for almost all common kitchen tasks. It’s especially useful for mincing, dicing, and thin slicing, particularly when working with vegetables, meat, and fish. A slight design flaw is its poor packaging – the Henckels Santoku comes without any protective cover, in a cheap-feeling plastic box. Other than that, the full tang and bolster prove to be greatly effective. Generally speaking, the model is reported to be of excellent quality. It’s manufactured by a company with a strong reputation in the industry and has all the perks you could desire from a Santoku. The Henckels knife passes the ripe tomato test with flying colors, providing paper-thin slices. It’s nicely balanced, with a weight of 6.4 ounces to support the process. Although some foods may stick to the edge of the blade, you’ll have an easy time controlling the knife when rapidly chopping. On the hunt for a classic Santoku knife? There’s no better way to go than with the J.A. Henckels 31170-181. In addition to the traditional Santoku specs, it stands out through fine quality and exceptional slicing performance. Speaking of quality – we couldn’t have completed our best Santoku knife countdown without shining light on one of the most competitive brands and models. We’re talking about Shun Premier and the TDM0702 – a true gem among commercial Santoku knives. Both elegant and powerful, the Shun Santoku costs around $225 on Amazon, but you may be lucky enough to find it on sale for less than $180. Either way, the pricey beauty is worth the long-term investment. Just a look at the Shun Premier 7-inch Santoku is enough to take your breath away. The craftsmanship exceeds that of all the other top knives in our guide by a mile, with a polished finish that will make it sparkle in your kitchen. The Shun knife has a traditional Santoku silhouette, with a 7-inch blade made of 32 layers of steel using the Damascus tradition. Furthermore, the Shun’s handle is made from premium Pakkawood and designed to slide like a glove in your hand. It’s obvious that the Shun Santoku is in a league of its own in terms of quality. Indeed, you pay a considerable price for it, but you get a striking piece of cutlery that will last a lifetime. Performance-wise, its edge retention has surprised even professional chefs, while the balance is perfect for swift movement. To make the most of your Shun knife, we strongly recommend that you put effort into maintaining and sharpening it as necessary to avoid chipping, scratching or breaking. If quality is what you seek in the best Santoku knife and you’re willing to pay enough for years and years of satisfaction, get the Shun Premier TDM0702. It may be remarkably expensive, but it’s an investment you’ll thank yourself for making. 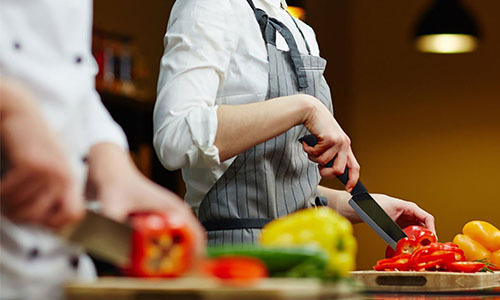 Although we always recommend preparing a hefty budget for a long-lasting chef knife, we’re aware that not everyone can afford to. Nonetheless, you can benefit from one of the best Santoku knife models even if you’re tight on cash. The Victorinox 41529 Santoku is definitely among them. You may be familiar with the brand for their famous Swiss Army knife, but you should also know that their kitchen knives are top value. The 41529 model, for example, is currently only about $45 on Amazon. The Victorinox 41529 has a traditional Santoku form, with a standard 7-inch blade made from stainless steel high in carbon. They have designed the model with their signature Fibrox Pro handle, which provides a secure grip whether it’s wet or dry. The 41529 knife weighs 4.6 ounces, making it a bit on the light side for the preferences of some chefs. Still, it can be an advantage for home chefs who want to prevent wrist fatigue when cooking for longer hours at a time. For the price, you enjoy surprising quality with the Victorinox 41529. Aside from a few complaints regarding the thinness of the blade, there aren’t many negative reports from consumers. 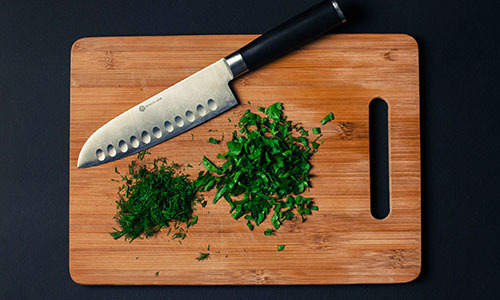 Your Santoku will arrive super sharp and ready to dice, slice, and mince most common foods. Thanks to the ergonomic handle and lightweight, the Victorinox 41529 is easy to maneuver. In addition, the maintenance process is less laborious than with other knives in its category. We fully back up the Victorinox 41529 as the best Santoku knife you can get on a budget. 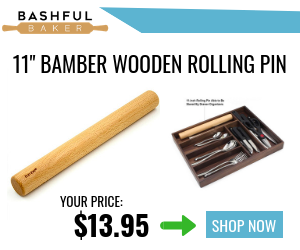 You pay less than $50 and receive a satisfying knife that won’t break if you care for it properly. For additional inexpensive models, you can check out our guide for the best chef knife under 100 dollars, but also our best chef knives under 50 dollars reviews. Now, for the moment we’ve all been waiting for – the best Santoku knife of the entire year. When choosing our #1 model, we took into account features such as functionality, quality, sharpness, maneuverability, and overall performance. In this regard, we couldn’t have picked a better Santoku than the Wusthof WU4183. Priced at just a bit over $100 on Amazon at the moment, the Wusthof WU4183 boasts a high customer average rating of 4.7 out of 5 stars. 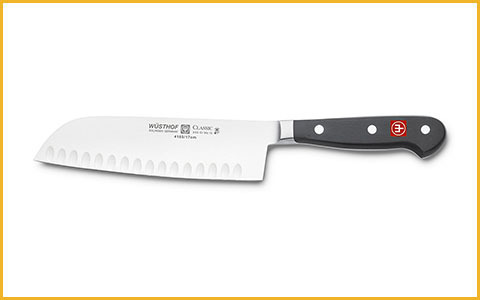 For the WU4183 model, Wusthof blends the best of both German and Japanese cutlery features. While the shape is that of a regular Santoku, the blade is made from durable German steel. The 7-inch blade also features a hollow ground edge so vegetables won’t stick to the sides when cutting. Moreover, the model has a full tang construction, ending with a comfortable Polypropylene handle. The knife weighs 4.8 ounces, while the full length from blade to handle is 14 inches. Thanks to the special German steel used for the blade, you won’t experience problems that usually occur with other Santoku knives. In other words, chipping, breaking or rust spots won’t be an issue. However, you should be careful and sharpen the knife in a suitable way to boost its long-term edge retention. Even though there are some quality control complaints, you can immediately send your knife back and get a replacement, owing to Wusthof’s lifetime warranty. All in all, the Wusthof WU4183 is probably the best Santoku knife you can purchase this year. It has a fair price and more than enough value to keep you satisfied in the kitchen. If you maintain it adequately, you should get a long and happy product life out of your Wusthof Santoku. In closing, you’ll now have a far much time deciding on what the best Santoku knife for you is. We’re confident that any of the models recommended will do your cooking justice, saving you time and effort in the process. As a parting suggestion, don’t forget to choose your Santoku based on blade length and handle design preferences. For more cutlery inspiration, don’t hesitate to take a peek at our best chef knives review and expand your collection. 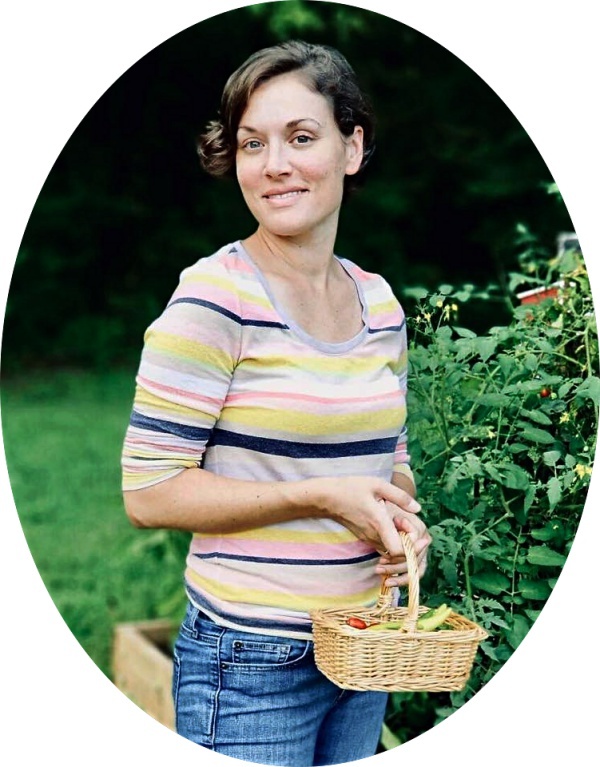 Enjoy stepping up your chef game!